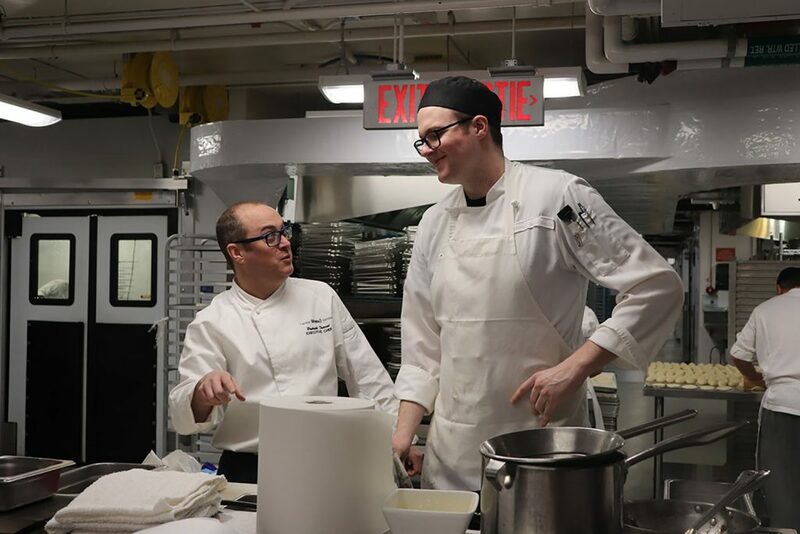 Note: The following is a guest blog post prepared by Shaw Centre’s Executive Chef Patrick Turcot, sharing news of an exciting mentorship project with which he is was recently engaged in the Centre’s bustling kitchen. Every year, Chaîne des Rôtisseurs, an international association of gastronomy dedicated to connecting those who share a love of and respect for food, holds a young chefs competition to support and develop the next generation of chefs. 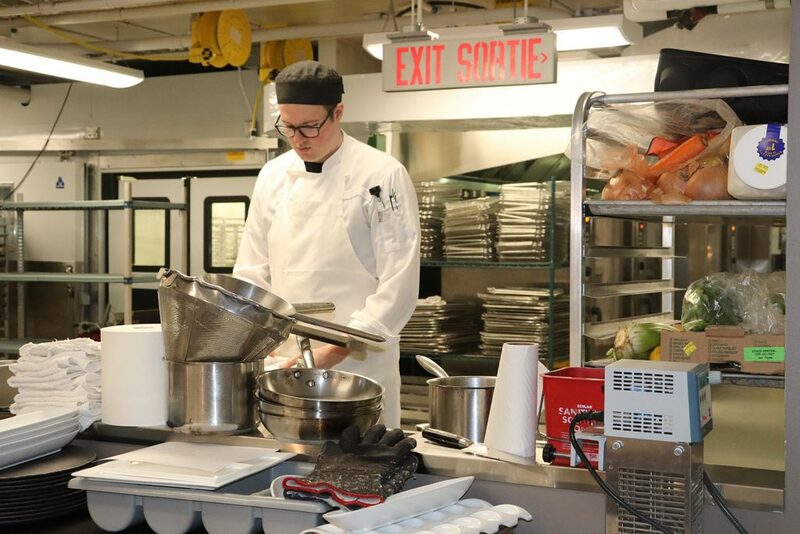 This year, I had the pleasure of working with Eric Hobson, one of our First Cooks, to help prepare him for the local regional competition that took place on June 2nd at Le Cordon Bleu Ottawa. I knew from experience that participating would give Eric an opportunity to showcase his talents while also learning from the creativity of his co-competitors and the expert feedback from the judges. I participated in several competitions earlier on in my culinary career but now I am more interested in mentoring and supporting young chefs to help them participate in events like this. I think competitions serve an important role in that they help fuel growth in our industry. Competitions are stressful but very worthwhile, offering invaluable learning experiences for the next generation of chefs. For me, it’s a chance to share my culinary passion with young protégés. I approached Eric several months ago because I knew he had the potential for success. His technical skills are excellent, and he is consistently very calm and collected in the kitchen, which would keep him from panicking during the pressure of the competition. 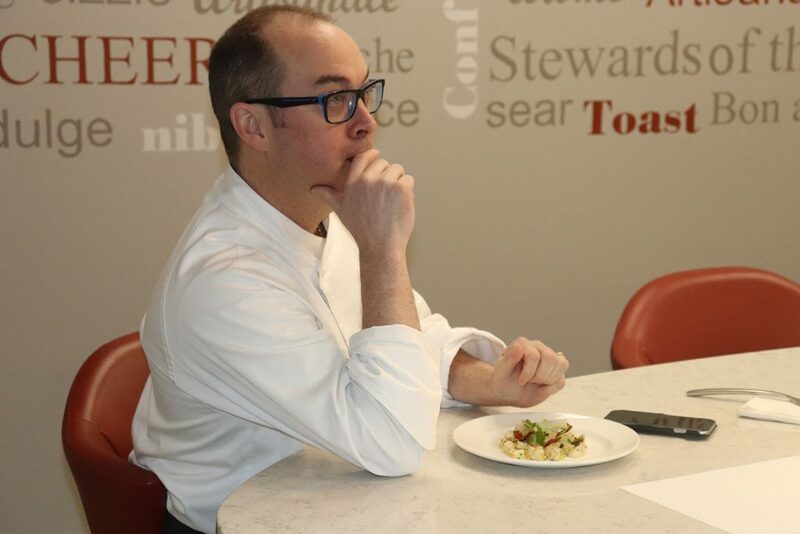 There, his task would be to assess a box of mystery ingredients, take a half an hour to prepare a menu incorporating those items, then spend three and a half hours preparing a three-course meal to present to the judges for evaluation. My coaching process with Eric was very intense but it has been exciting to watch him develop. I set three black box challenges for him over the past few weeks, composed of the kinds of ingredients I anticipated he would encounter in the competition. Eric indicated that he found the challenges demanding, both mentally and physically, but extremely helpful. As Executive Chef, I can attest that It was an honour for our whole Shaw Centre team to have Eric represent us at this prestigious competition. I was on the panel of judges who assessed the competitors’ creations in a blind tasting format, and although Eric did not end up winning the competition, he was a true example of how we want Shaw Centre to be represented within our community. I am very proud of his performance and would like to thank him for being an ambassador for the company and the Ottawa region. He is a definite source of inspiration to the younger members of our brigade. © 2018 Ottawa Convention Centre® Corporation. All Rights Reserved.